Who knew people cared so much about what goes into their guacamole, to the point that the suggestion of adding an ingredient for “green” purposes would create such rancor? In a seemingly innocuous story, no doubt timed for July 4 festivities, New York Times food columnist Melissa Clark touted adding fresh peas to the picnic staple. It seemed like a good suggestion in light of California’s drought and the gazillion gallons of water needed to grow one avocado. People started falling into different camps. @POTUS @MelissaClark #peasout? or #givepeasachance? We have to stand with Ms. Clark on this one. 1. Bring a medium pot of salted water to a boil and prepare a bowl with water and ice. Plunge peas into the boiling water and cook until al dente, about 1 minute. Drain peas and immediately transfer to the ice bath. Drain. 2. Heat broiler to high and broil one of the jalapeños on a heatproof pan. Cook, turning occasionally, until jalapeño is completely charred. Transfer to a small bowl, cover tightly in plastic wrap and let sit for 15 minutes. When cool enough to handle, use a towel to wipe off the charred skin. Halve, seed and devein the roasted jalapeño. Then halve, seed, and mince the remaining raw jalapeño. 3. In a blender or the bowl of a food processor, purée peas (reserving 2 tablespoons for garnish) with roasted jalapeño, minced raw jalapeño, cilantro and 1/4 teaspoon salt. Process until almost smooth but still a little chunky. 4. 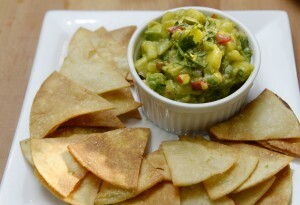 In a medium bowl, combine mashed avocado, scallions, lime zest, lime juice, remaining 1/2 teaspoon salt and the pea purée. Adjust salt and lime juice as needed and garnish with fresh peas, sunflower seeds and flaky sea salt. Serve with tortilla chips and lime wedges. View the full recipe on ABC Cocina chef Jean-Georges’ website.